Filmmaker Ti West is one of the lone bright spots for me when it comes to horror films, the one genre that I have an issue embracing on a regular basis unless the material is something truly special. 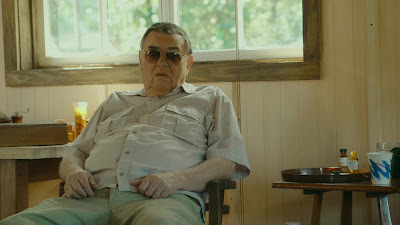 The House of the Devil and The Innkeepers are two of my favorites of recent memory, so I was very much looking forward to his next work The Sacrament, and for the most part the film worked. Essentially the film owes its entire concept and story to the real life Jonestown Massacre that tragically occurred in 1978, and drawing that inspiration on its own doesn't necessarily trouble me, but the handling of it in this case does. On top of horror being a genre I struggle with, my least favorite sub-genre to go with it is this entire fascination with the idea of "found footage". It was once innovative and exciting when The Blair Witch Project shocked audiences and became a box office sensation, a film that honestly made me scared to go into the woods at the time, but the entire idea of fooling people into thinking they are watching real events has run its course. What frustrates me so much about The Sacrament is, had West handled this material in a similar fashion to his previous two films I already mentioned being a fan of, just a traditional fictional narrative rather than trying to present the illusion of actual footage, I really believe this could have been a fantastic film rather than the missed opportunity it actually is. The hand-held camera aspect gives the experience an amateurish feel for me, and occasionally the dialogue suffers thanks to writing that needs to make it clear that this is a found footage film, reminding the audience like a giant flashing sign that "THIS IS REAL! YOU ARE WATCHING SOMETHING REAL!" even though we simply aren't falling for it anymore. We know these are actors, but having actual lines of dialogue in which a character tells the camera that they hope this footage is found by someone in case they die just mars the experience with unnecessary, eye-rolling cheese. A straightforward work of fiction crafted very well regarding disturbing events like this would have worked far better and felt far more mature than the way this was presented. The usage of found footage for a film that is so clearly based on a real life tragedy is a tad unsettling because it brings a level of insensitivity to the project. The point of found footage is to present a "documentation" of events that seem almost stranger than fiction, a moment in time that seems so absurd yet is presented as reality, therefore seeming to be more believable than it should. Making a found footage film of something that actually happened, a concept ripped straight from actual history, seems like you are showing an audience the real, horrific events, showing no actual humanity towards those that really died in 1978. Surprisingly, after writing what is clearly a mostly negative review of The Sacrament, I actually did enjoy the film and was impressed by much of it. The Ti West style of building a slow burn tension before finally unleashing the disturbing works wonders again here, and my goodness do I mean disturbing in the case of this film. This is a dour, unsettling work, and the events that occur near the end are not something that compel me to revisit it any time soon, but clearly some real talent was at hand here that I can appreciate. Please, for the love of God, enough with the found footage though. Just make an intelligent, well made film and I will buy in without having to pretend it's real. THE SACRAMENT would't be the first movie I'd recommend to a Ti West virgin. That honor would have to go "The House of The Devil" which is one of the best horror movies I've ever seen. But even lesser Ti West is far better than most of the utter trash that has been foisted on the public as horror in recent years.